The handloom sector is facing a new crisis, even more serious than issues of competition, marketing, technology, livelihood and quality of life that have inhibited Indian weavers for decades from access to the unlimited opportunities that are possible today. The latest crisis could eliminate India’s rich handloom advantage forever. The crisis became evident suddenly, ostensibly in an official bid to protect destitute handloom weavers with technology that can raise their productivity and earnings. In fact, this is a bid from power-loom operators to change the definition of ‘handloom fabric’ and convert handloom production into power-loom production. The strange logic is that this would give power-loom weavers the ‘benefits’ available to weavers under current GoI schemes. So one sector is to be weakened to strengthen another, even though it is common knowledge that very few of current handloom schemes are able to serve weavers’ priority interests. The proposed change in definition of ‘handloom’ production would be that even if one process is done by hand, and all the others motorized, the product would be declared as ‘handloom fabric’ and made eligible for ‘handloom’ incentives. If this happens, handloom production, with all its richness, would die and the output would be power-loom cloth. In a consultative process of stakeholders with Government that led to the 12th Five Year Plan for handicrafts and handlooms, this incredible idea was never mentioned. It has come to light as official teams have been visiting weavers clusters, and alarmed weavers have contacted those of us who work in the sector and begun morchas and other protests, most recently in Maheshwar. The Planning Commission has expressed serious concern over this development. Several meetings at the Commission have failed to halt this adventure, which is believed to be centred in Madhya Pradesh within concentrations of power-loom weavers facing acute difficulties in that state — one of which is the erratic power supply. (If for no other reason, this alone makes the current bid to change handloom definition a no-brainer. Where is the power for motorizing handlooms to come from?) The handloom weaver incentive schemes that are to be extended to power-loom weavers are an illusion. Reviews of these schemes during the drafting of the Twelfth Plan, and more recently at a seminar with weavers in Kolkata, revealed that many are out-dated and irrelevant in a changed market, requiring review and drastic reform. Weavers tell us the recent bid on changing definitions is an election-year stunt, to win over the power-loom lobby which is relatively affluent and more strongly organized than dispersed handloom weavers. Yet the impact of any change in definition would be immediate and unalterable. A meeting has been called at our request by Dr Syeda Hameed at the Planning Commission on October 21 to draw attention to all that is at stake for the millions dependant on handlooms and for the future of a major Indian advantage. The note below attempts to capture key issues. Of these, protecting the definition of the handloom is perhaps the ‘single-point agenda’. The Handloom (Reservation of Articles for Production) Act 1985 defines a handloom as “any loom other than a power loom”. Weaver communities and craft activists across the country are alarmed by the reported intention of the Ministry of Textiles to change the definition of handloom cloth. It appears that an official memorandum to this effect was issued by the Ministry in May 2013. A committee was established to look into the matter. No weavers or civil society activists in the sector were included in this committee. (However, the power-loom industry was represented). There was no consultation with the Working Group established to help draft the 12th Five-Year Plan for the handloom sector, nor any communication on this policy intention to Working Group members. The intention is to define handloom cloth to include the output of looms where only one process is done by hand (while other processes can be motorized). This proposal is utterly misconceived, and threatens the future of millions employed in the handloom sector, including weavers and all those involved in pre- and post-loom processes. Motorized production would fundamentally alter the definition of handloom cloth as understood for all the decades of India’s handloom movement and handloom promotion effort. The impact could be devastating on India’s second largest source of livelihood after agriculture. A conservative estimate of the number of handloom weavers who would be affected is 3M, not including those involved in pre- and post-loom processes which are largely managed by women. The handloom sector is challenged by an era of rapid change in markets and by escalating competition. These current challenges can be addressed without altering and endangering the qualities which give India’s hand-woven fabrics a global reputation for excellence and a unique competitive advantage. This is demonstrated by rising global demand, even in years of economic recession. (One estimate of handloom cloth exports from India in 2010-11 was $156M, up 34% from the previous year). To protect this status, the present definition of handloom cloth and handloom production must be held sacrosanct. Within this definition, there is ample scope to improve productivity and quality, to reduce drudgery, and to lift the earnings of weavers — and to achieve all this without any risk to what distinguishes this world-renowned fabric. 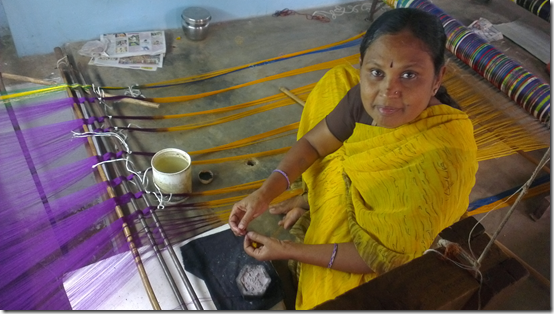 The Weavers Service Centres (WSC) of the Government of India are the repository of this technical know-how. What the sector requires is not power motors but rather aggressive efforts to spread awareness of available WSC technologies as well as training through these Centres and through other competent institutions such as the NID and NIFT networks. Giving weavers access to technology needs to be matched with a national marketing strategy to raise and sustain demand for this great product at home and overseas. There is no other way to address the constant threat of competition and changes in consumer preferences, particularly among the young. Promoting the contemporary advantages of handloom cloth, building its value, and encouraging the consumer to distinguish between handloom and other production through a widely-advertised Handloom Mark could all be elements within such a national marketing strategy. The recommendations and programmes outlined in the 12th Five-Year Plan for the handloom sector should be the focus of Government’s efforts. The Plan has the acceptance of the entire sector, reflecting months of joint reflection on current challenges and needs. Motorization of handlooms is not mentioned in the Plan, which was the outcome of a long and inclusive process of consultation by the Ministry of Textiles with stakeholders. The consultative mechanisms established for drafting the 12th Plan should continue to support its implementation, including through the review of past schemes intended for weavers and for handloom promotion. Many of these no longer respond to the realities of changing markets and competition. There is an urgent need for a fresh Handloom Policy to help guide the development of the sector in coming years. Such a policy must reflect the major changes in markets, technologies and competition that have taken place since the Handloom (Reservation of Articles for Production) Act was introduced in 1985, as well as the challenges experienced in enforcing it. India’s hand-woven cloth, once the ‘fabric of Freedom’, is today a contemporary fabric without equal. It responds to some of the most urgent challenges of our time: sustainable and skilled livelihoods for citizens where they are located and a brake on the miseries of migration, livelihood opportunities for those still on the margins of society (including SC/ST/minority communities, and women), ecological sustainability and a low carbon footprint, unrivalled comfort and adaptability, rising global demand (even during years of recession) for what many consider the world’s greatest fabric, and a major contributor to social and political stability. The arguments of justice and equity that Gandhiji raised during the Freedom struggle have a present-day resonance. Not just a product, handloom fabrics continue to represent a unique blend of values that are economic, social, cultural, environmental and even spiritual. An India without the integrity of handloom fabrics is an unthinkable prospect. An incalculable loss must be averted.